So as usual, my blog is a collection of my rambling thoughts and opinions, but where applicable referenced or signposted to more information. Enjoy! It prompted a few of us to have an go and create our own Prancercise clips (you can check out my efforts here). It also piqued my curiosity. Surely it was just a piss take. But in the often weird and wacky world of fitness, you never know…. Google led me to its founder, Joanna Rohrback, a Wikipedia page, a website and a book.In spite of it’s almost credible description as a ‘holistic fitness method’ Prancercise is greatly mocked. Of course it’s easy to see why. ‘Prancing’ sounds a little too flouncy, even for the alternative aficionados. But it made me wonder. If Joanna had maybe come up with a better name for her unique form of exercise, marketed it slightly differently, might it have taken off? Imagine, gym classes or areas of the local park dedicated to the art. You laugh (hopefully), and think I am being ridiculous, which of course, I am. But there is a serious point here. As a Physio, I fear all too often our focus as a profession, is a little narrow when it comes to exercise prescription. Maybe because we lack understanding or confidence in this area, or maybe we are simply dazzled by well marketed, money spinning fitness fashions. I’m intrigued with how exercise routines come and go, what makes them popular, and how commercial success can, at times, be at odds with clinical excellence. When I graduated, Swiss balls (originally an Italian invention called the Pezzi) were all the rage. Hard to imagine now they are just bog standard gym equipment, but once upon a time, they were the bee’s knees. Exercising with a giant inflatable ball defined an era. 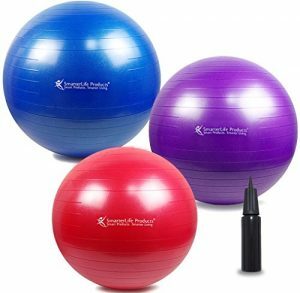 Although used in the treatment of spinal injuries and neurological conditions in the UK since the 1970’s, the Swiss Ball really hit the big time after being picked up, rebranded and marketed by the Americans. Don’t get me wrong, they are still a useful bit of kit, but back in the 1990s, core stability was king and ‘The Ball’, was rehab personified. Such a simple bit of kit. So versatile! (Many threw out office chairs in the belief that sitting on an inflatable surface was healthier). Working with The Ball could cure all! But the ball had its limits (it was a bugger to store, and vulnerable near the office stapler). And anyway, there was a new kid on the block that was about to eclipse the bouncy brigade. One that didn’t carry the risk of puncture, but that played equally on insecurities around spinal stability. An exercise regime which promised the poise and grace of a ballerina, and the strength of an Olympic athlete…..
Pilates, although had been around for many years, was still a twinkling in the eye of commercial success when I attended a sports conference in New Zealand (around the year 2001), and saw for the first time a ‘reformer’ in action. Other fashions (for want of a better word) that have crossed the clinical / fitness divide include Functional Exercise (I shall direct you to Erik Meira’s brilliant blog on this topic), Vibration Plates (yup, that’s a thing and I have seen them with my own eyes in both mainstream and rehab gyms), and of course, no workout or rehabilitation programme is complete these days without a bit of rolling around on foam. Now the problem with adopting these things into clinical practice is that they serve to perpetuate a lot of myths and misconceptions around pain and injury. The evidence showing that posture, core stability, or tight fascia are the cause of our malaise, is at best poor, at worst, non –existent (see more information here and here). Unfortunately, the marketing machine is more concerned with profit, not proof. OK, so it’s unfair to lump Pilates in the same camp as a vibrating platform, but somewhere along the line, it seems to have gained superior status in the world of therapeutic exercise. In reality, there is no credible proof that this is the case (reference here and here). My point is, as clinicians we need to stop putting all our eggs in one basket (or Swiss balls in one gym) when it comes to exercise. It’s time we cast our net a little wider. We need to get really good, no, not good, brilliant, at exercise prescription We need to figure out how to best engage more people with activity, put our efforts into developing the evidence base. We need to lead, not follow, innovate not imitate. And we definitely need to stop buying into gimmicks. I think our current narrow thinking around exercise as a treatment is doing our patients and our profession a disservice. 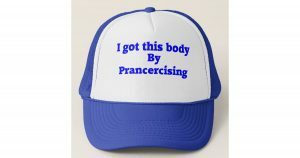 As for Prancercise? Well if nothing else, it’s honest. The website makes clear the effects are the anecdotal experience of the author, and doesn’t actually make any overinflated pseudoscientific claims. Maybe that’s why it never took off.